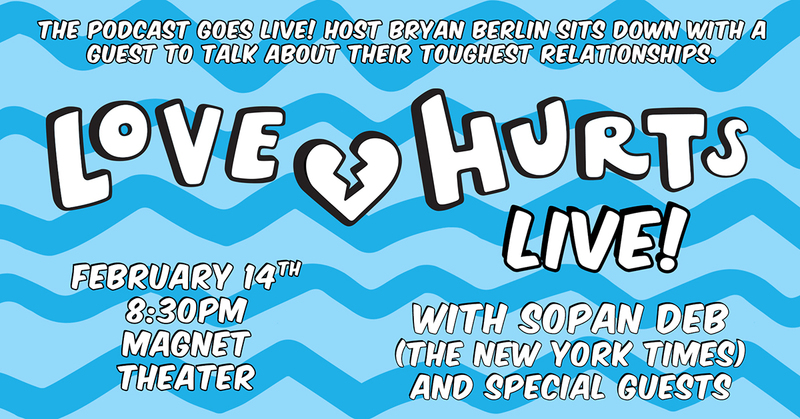 Love Hurts is a podcast hosted by Bryan Berlin that celebrates the messiness of relationships, whether with family, friends, partners, faith, or passions. Each episode features a new guest sharing stories they normally don't share with anyone in a public conversation about their struggle with love. In this special live episode, Bryan brings the podcast to the stage for a night of stories of tough love. Storytellers will share their own personal love hurts stories with the audience before Bryan sits down with a featured guest to take a deep dive into their story and work to laugh away the tears! This show features stories from Stacey Bader Curry (Moth GrandSLAM Winner) and Richard Cardillo (6x Moth StorySLAM Winner) as well as a sit down interview with New York Times culture reporter Sopan Deb.